Low-NOx furnace burners have been developed for a variety of applications in industries that utilize furnaces for process heating in nonattainment areas. These can be retrofitted on existing furnaces and purchased with new furnaces. Due to the multiple-burner configurations on most process furnaces, most low-NOx burner technologies do not employ flue gas recirculation. They primarily rely on combustion staging technologies and air/fuel mixing. 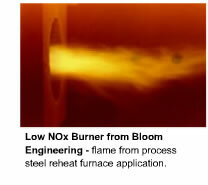 The Gas Technology Institute developed a novel approach to reducing NOx in burners for process heat furnaces. The technology, known as oscillating combustion, employs a solid-state ceramic valve to constantly adjust the fuel supply to a burner. In demonstrations in a variety of process heat applications, the technology reduced NOx emissions in the 50% range and reduced fuel use due to improved heat transfer. A listing of equipment vendors that provide low-NOx burners for process furnaces is shown in the vendor listing. Specific information about the various types of burners available can usually be found on the burner vendor's website. When the fuel flow rate to a burner is oscillated with a special valve action, it creates oscillating combustion. The oscillation creates successive, NOx-formation-retarding, fuel-rich and fuel-lean zones within the flame. Heat transfer from the flame to the load is increased because of more luminous fuel-rich zones and the breakup of the thermal boundary layer. The increased heat transfer shortens heat-up times, thereby increasing thermal efficiency. One of the major benefits of this technology is that it can be installed as a simple retrofit, requiring no burner or furnace modification. Furthermore, recent testing has shown significant fuel savings and NOx emissions reductions. Several field evaluations of oscillating combustion have been completed. One was on a batch-annealing furnace in a steel mill. It showed a 2% to 5% fuel savings and a 32% NOx reduction. Another was on an oxy-fuel-fired glass melter in a fiberglass plant. Fuel savings of 3% to 4%, oxygen use savings of 10% to 14%, and a NOx reduction of 55% were documented. In another recent evaluation at a forging facility, fuel savings of up to 3% and NOx reductions of up to 49% were achieved. Oscillating combustion can be applied to many types of furnaces used in the steel industry, including box annealing, steel reheating, and ladle drying and preheating. In addition, it is expected to be used widely in glass melters, aluminum melting furnaces, forging furnaces, metal-melting furnaces, cement and lime kilns, and other high-temperature furnaces. Designed for both natural and forced-draft operation, the ULE burner internally recirculates furnace flue gases to reduce the rate of NOx formation without compromising efficiency. Advanced system components (burners, sensors, control systems, and heat exchangers) are being developed for use in both new and retrofit applications.